Born in Glasgow, the second son in a family of eleven children, his father was a superintendent of police. From an early age he was interested in a career as an architect, and when he was sixteen he was articled in the office of the Glasgow architect John Hutchison, studying at the same time as an evening student at the Glasgow School of Art. Here he came into contact with J. Herbert MacNair and the Macdonald sisters, Frances and Margaret (wham he later married), with whom he was to form the group which became known as the Glasgow Four. They exhibited together on a number of occasions; the work shown at the 1896 Arts and Crafts Exhibition was greeted with incomprehension and distaste. 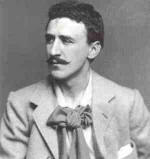 Meanwhile, in 1889, Mackintosh had joined the firm of Honeyman & Keppie, where he remained until 1913, becoming a partner in 1904. All his most important architectural and decorative work was done during this period, and it is clear that he was allowed a degree of autonomy within the firm, developing his own markedly individual style in a way that is not usually possible for a man without his own independent practice. In 1896 Mackintosh, in his capacity as an assistant at Honeyman & Keppie, won the competition for the building of the new School of Art in Glasgow. From 1897 until 1906 he was occupied intermittently with designing and furnishing the chain of tea-rooms established in Glasgow by the Misses Cranston as part of a campaign to combat the widespread daytime drunkenness which was a scandal in the city. In spite of the provision of billiard rooms, the original and elegant schemes seem to have done very little to wean the hardened drinkers from their accustomed haunts, but they allowed Mackintosh to experiment with the possibilities of commercial production on a considerable scale. He exhibited, with the other members of the group of the 'Four', a number of times with the Wiener Werkstatte, and found greater acceptance of his ideas on the Continent than in his home town or in London, though he had patrons in Scotland who allowed him a remarkable degree of freedom to pursue his ideas, notably the publisher, Walter Blackie, for whom he built Hill House at Helensburgh. After he left Scotland in 1913 he did very little more work, and in 1920 he gave up architecture and devoted the remainder of his life to painting. In the pantheon of heroes of the Modern Movement, he has been elevated to a cult figure, such that the importance of his late 19th-century background and training in Glasgow are often overlooked. He studied during a period of great artistic activity in the city that produced the distinctive 'Glasgow Style'. As a follower of A. W. N. Pugin and John Ruskin, he believed in the superiority of Gothic over Classical architecture and by implication that moral integrity in architecture could be achieved only through revealed construction. Although Mackintosh�s buildings refrain from overt classicism, they reflect its inherent discipline. His profound originality was evident by 1895, when he began the designs for the Glasgow School of Art. His decorative schemes, particularly the furniture, also formed an essential element in his buildings. During Mackintosh�s lifetime his influence was chiefly felt in Austria, in the work of such painters as Gustav Klimt and such architects as Josef Hoffmann and Joseph Maria Olbrich. The revival of interest in his work was initiated by the publication of monographs by Pevsner (1950) and Howarth (1952). The Charles Rennie Mackintosh Society was formed in Glasgow in 1973; it publishes a biannual newsletter, has a reference library and organizes exhibitions. The Hunterian Art Gallery, University of Glasgow, which opened in 1981, holds the Mackintosh estate of drawings, watercolours and archival material as well as a collection of his furniture; the Glasgow School of Art and the Glasgow Art Gallery also have important collections.